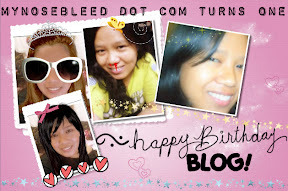 Yeah, mynosebleed dot com is celebrating its 1st year in the blogosphere! Thank you to everyone who dropped by. It’s been a wonderful year of friendship and love affair. Seriously, as a way of giving back to you what you have given me, I am giving away free domains to 3 lucky souls. Walang criteria. Basta trip trip lang. Kahit hinde worth it LOL. Wala ding kondisyones like link backs or anything (konsyensya nyo na yun LOL). But of course, in true nosebleeding fashion, may code na kelangan i-decrypt or mathematical equation na dapat i-solve. To follow na lang yun. Meantime, goodnight muna. i want! i want! i want! lols! oi mare happy birthday to our blogs. ambilis ng panahon. i want it! !i want it! !nao na!!ahahaha.. credit card na ba pamimigay mo next year? Kung di dahil sa yo… wala ako ngayon dito. If you are interested, kindly mail back at k5sino@bigstring.com, indicating your blog for reference, and I’ll send you back pricing details, guidelines and processes. Looking forward to doing business with you. Happy Blog Anniversary/Birthday 🙂 More $$$ , o di ba?